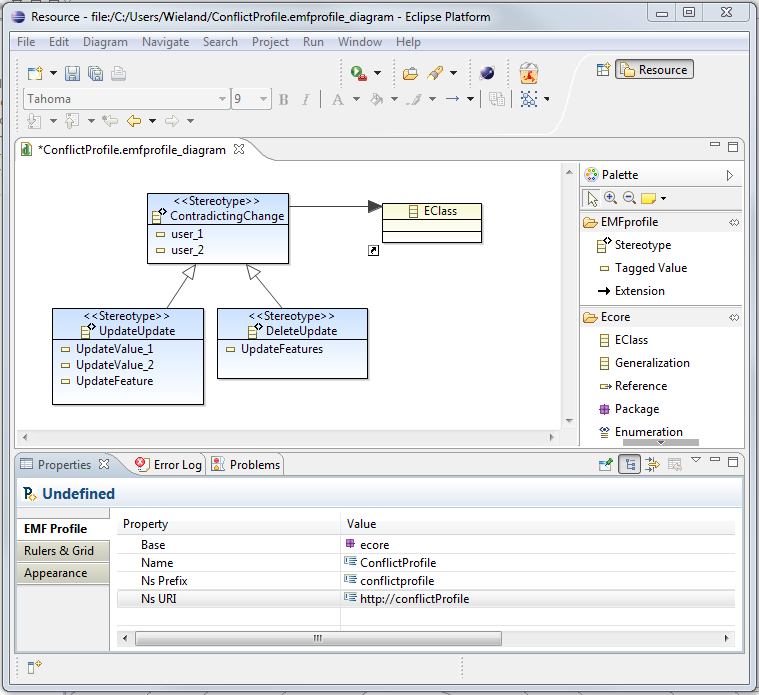 EMF Profiles can be seen as an adaptation of the UML profile concept to DSMLs. Profiles have been a key enabler for the success of UML by providing a lightweight language-inherent extension mechanism which is expressive enough to cover an important subset of adaptation scenarios. We believe a similar concept for DSMLs would provide an easier extension mechanism which has been so far neglected by current metamodeling tools. Apart from direct metamodel profiles, we also propose reusable profile definition mechanisms whereby profiles are defined independently of any DSML and, later on, coupled with all DSMLs that can benefit from these profiles. Our approach has been implemented in a prototype integrated in the EMF environment. The source code of EMF Profiles is published under the EPL 1.0 and hosted at a dedicated EclipseLabs project. If you experience any bugs, please report them there! If you have any questions regarding EMF Profiles, please consult the dedicated news group. Philip Langer, Konrad Wieland, Manuel Wimmer, and Jordi Cabot: "From UML Profiles to EMF Profiles and Beyond"
In Proceedings of the 49th Conference on Objects, Models, Components and Patterns (TOOLS'11), 2011. LNCS 6705, Springer. Hugo Bruneliere and Philip Langer: You need to extend your models? EMF Facets vs. EMF Profiles at the Modeling Symposium @ EclipseCon NA 2012. Access slides. Journal of Object Technology, 11 (2012), 1; 29 pages.